Most government agencies work in mysterious ways, often times closed off from the public until their work is done and a final report is issued. The National Transportation Safety Board, however, has taken a different approach over the past few months. The NTSB has heavily leveraged Twitter and YouTube to keep the public informed on their investigations, going as far as publishing quotes from press conferences in real-time. During normal operations, the NTSB Twitter feed may see one or two updates a day, reading something like “NTSB is investigating today’s crash in San Luis Obispo, CA involving a Cessna 337 Skymaster.” on June 24th. 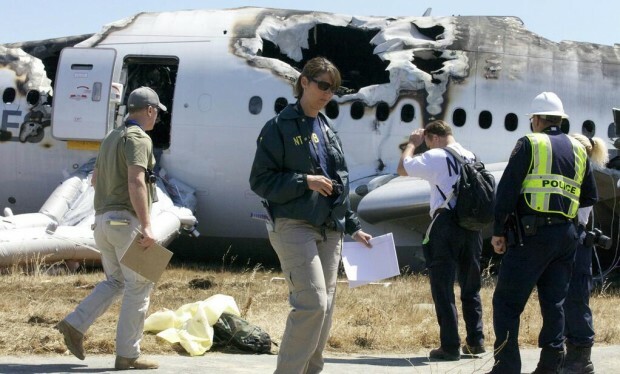 During major investigations such as the crash of Asiana 214, this feed becomes a vital pipeline of information between the NTSB and the public at large. 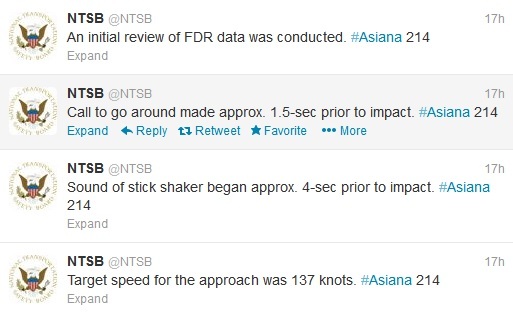 The first Tweet about Asiana 214 from the NTSB came at 12:23pm, less than one hour after the crash. One hour after that, the NTSB announced via Twitter that they would be holding a press conference at Reagan Airport Hangar 6 before departing for San Francisco. 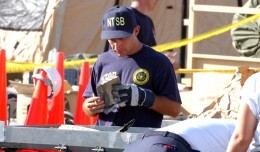 Less than 12 hours after the crash, the NTSB released a photo showing investigators conducting their first site assessment. Throughout the night, the NTSB released several photos of investigators beginning their work, as well as Deborah Hersman, Chair of the NTSB, being interviewed. 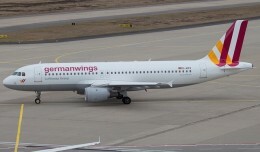 At 8AM, still less than a day after the crash, the NTSB released a photo showing that the flight data and cockpit voice recorders had already been retrieved and brought back to Washington D.C. for analysis. At this point, the Tweets not only kept the public informed, but were a testament to the speed at which the NTSB reacts to an emergency. @OMLee – #Aasiana214 is not a crime scene. The NTSB is an accident investigation agency, not a criminal investigation agency. 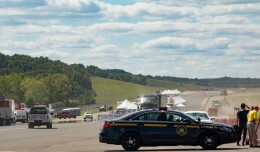 Over the course of the night, the NTSB responded to several other questions and comments, one of which criticized the agency for posting photos of the crashed airplane. The NTSB does not have an easy task, and the work ahead of them will likely take over a year. In the meantime, it is great to see a government agency keeping the public so well informed on their progress through unconventional means, showing that they have kept up with the pace of technology. @ashleyv – It is not the first time – it is a part of our standard operating procedure. Great article – really interesting to see a government agency be so proactive. Here’s a related article on how some of the airlines and Bay Area airports performed on Twitter immediately following the crash.